Hepatocellular carcinoma (HCC) is the primary malignancy of the hepatocytes accounting for nearly 90% of all the liver cancers, which is the fifth most common cancer around the world. HCCs are most common in damaged liver parenchyma. Chronic hepatitis B virus (HBV) and hepatitis C virus, alcohol and steatohepatitis induced hepatocyte damage are the most common predisposing etiological factors for HCCs. HBV is the main etiology responsible for most of the HCC cases observed in Africa and the Asian parts of the world due to its high prevalence. However, due to the global utilization of vaccination programs, the HBV -associated HCC incidences are getting lower. One-third of the cirrhotic population develops an HCC throughout their lives, with an annual incidence of 3-5%. There are numerous classifications and staging systems for planning the treatment of HCCs, but every HCC and every patient must be evaluated individually. Treatment options for HCC have a wide range of modalities that change according to the stage of the tumor and the patient specific factors. In 70% of the HCC cases, the treatment modalities used are not for curative intent. When diagnosed, 50% of HCC patients are suitable only for some palliative treatment modalities such as transarterial chemoembolization, chemotherapy and sorafenib, which are proven to be effective on the HCCs by giving a median survival of 11-12 months at max. For the remaining 20% of the patients, symptomatic and supportive treatments can be used within a very limited survival period of < 3 months. The curative intent treatment modalities vary among a simple curative resection of the HCC, ablative methods, and liver transplantation, and these methods are usually suitable in patients with small size HCCs. However, these curative treatment options may be possible only for 30% of all the HCCs with 5-year survival rates of 40-70%. Liver transplantation itself has an advantage over other curative therapies by eliminating both the HCC and the underlying cirrhosis. However, resections and ablations for a curative intent should also be preferred because of the shortage of donors. The incidence of the HCCs increased in years from 2.8 per 100,000 in 1979 up to 4.6 per 100,000 in 1999. Every year over 571,000 new cases are diagnosed with HCCs, most of them (44%) from China. Annually, 552,000 deaths due to HCCs or HCC related consequences are seen worldwide. It is estimated that nearly 20,000 liver transplantations are annually performed all around the world for all indications. When compared to the annual cases diagnosed and yearly deaths seen due to HCCs, this overall transplantation number is more than insufficient. That’s why these resections and local ablative methods must be performed much more frequently in every HCC case possible to improve survival rates at different stages if possible. How to decide: which way to go? what to do? HCCs’ stage evaluation is essential to decide on the treatment modality to be chosen. The stage of the disease and the status of the patient give an idea about the resectability, the prognosis and the therapy to be chosen for the HCCs. 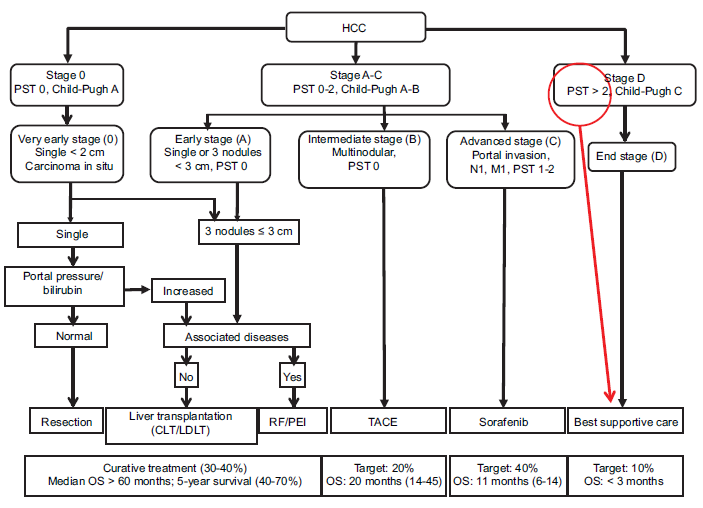 There are various staging systems applied for staging of the HCCs in the literature such as Barcelona Clinic Liver Cancer (BCLC), Cancer of the Liver Italian Program, Group Study and Treatment of Hepatocellular Carcinoma, Chinese University Prognostic Index, Japan Integrated Staging, and Okuda or Tokyo. From these staging systems, the BCLC classification has been generally proposed as the backbone of the HCCs treatment that has been approved by the European Association for the Study of the Liver and American Association for the Study of Liver Diseases. The system encounters the size, number, extra-hepatic dissemination and vascular invasion of the tumor. It also uses the Child-Pugh score system for the liver function, examines the presence of portal hypertension and the Eastern Cooperative Oncology Group (ECOG) classification for the health status of the patient. Every detail and finding about the HCC and the patient are important in deciding the right stage, treatment choice, prognosis, and outcome of the disease. Hence, evaluation and the content of the staging systems must be well-known by the surgeons to avoid a misdiagnosis or an overtreatment that is ineffective and unnecessary for the patients. The only handicap of the staging systems, scores, grading systems, classifications, algorithms, charts is the difficulty in memorising, remembering and/or recalling the contents of them. Moreover, most of these systems do not include any data about surgical details such as extent of liver resection, intra-hepatic distribution of the tumor(s), and the technical feasibility of the resection that are all vital for the surgeons in deciding the surgical resections of HCCs. A mnemonic acronym to decide and choose the resectable HCC: "PERISH"
This phrase "PERISH" is designed to help practically and easily the surgeons in choosing the HCCs to be resected in an algorithm, while evaluating a patient. It is a mnemonic acronym designed for: Performance of patient, Extra-hepatic disease, Reserve of the liver, Intra-hepatic distribution, Stratifying risk factors, Hepatectomy size. All these factors are of great importance in patient selection that will be eligible for the surgery. These patients with HCC, if eligible for a resection will be candidates for one of the major surgeries in the general surgery practice. This may be a small size resection or a major hepatectomy if the HCC and the patient are suitable. Hence, even if there is a chance of surgical resection as a cure for the disease, there are patient factors that are as important as the HCCs status when the surgeon is making a surgery decision. The age of the patient, debilitating and co-morbid diseases (cardiovascular, renal, pulmonary, etc.) are the important factors that help the surgeon in making the evaluation. The age of the patients is an important factor affecting the outcomes of the surgical interventions. During the years 1991-1995, in USA, the HCC incidence increased significantly in 40-60 years old patients up to 2.4 per 100,000 from 1.4 per 100,000. Furthermore, a more objective criteria, the ECOG classification for the health status is used in the BCLC staging of the HCCs [Table 1]. Here, the patients’ performance in doing their daily routines and taking care of their own needs are taken into consideration. The ECOG Class 0, Class 1, and sometimes the Class 2 can tolerate the surgical treatment. However, ECOG Class 3 and Class 4, due to their debilities, cannot be candidates for a surgical intervention whatever the HCC status is. The end stage HCC (BCLC Stage D) accounting for the 20% of the HCCs also includes ECOG Class > 2 and/or Child-Pugh Class C patients. These are directly classified as the terminal stage patients that are only candidates for supportive treatments with a survival period of < 3 months [Figure 1]. Poor patient performance is an early indicator for the treatment decision without a need for a further investigation in ECOG > 2 patients who are symptomatic and in bed > 50% of the day. Here, the extra-hepatic dissemination of the HCCs is evaluated, which is an important finding in the advanced stage HCC diagnosis (BCLC Stage C) and helps in the differential diagnosis of the intermediate stage HCCs (BCLC Stage B). The portal vein invasion, lymph node positivity (N1) and distant metastasis (M1) are the pathognomonic findings of the advanced stage HCCs. These HCCs tend to be mostly locally advanced cancers that have a high affinity to make lymph node metastasis (30%). The distant metastasis is seen less frequently (13.5%); most commonly to lungs, bones, peritoneum and the adrenal glands. [11-13] There are some authors suggesting surgical resection for the distant metastasis to lungs or adrenal glands for a better prognosis in HCCs with up to three pulmonary lesions. However, this is not generally accepted. The major vascular invasion that cannot be reconstructed also leads to the HCCs advanced stage. The vessel invasion is more common in extra-hepatic disseminated HCCs. [12,13] In these situations, only sorafenib treatment and even in some, only the supportive treatment modalities can be used. Since 80% of these HCCs originate from the cirrhotic livers, resection of these tumors is a much more complicated issue. The pitfalls of liver surgery in these patients are inadequate functional remnant, decreasing in liver regeneration capacity and increasing probability of haemorrhage due to portal hypertension. When inadequate liver remnant is left behind, this may lead to hepatic insufficiency and failure, which is the most common cause of death in this group. Calculation of liver reserve should be the third step of the evaluation. There are several staging methods to determine the hepatic reserve as Model for End-Stage Liver Disease, Indocyanine Green (ICG) Retention Test, Metabolism of Lidocaine to the Metabolite, and Arterial Body Ketone Ratio. However, the most widely accepted staging system is Child-Pugh classification as A, B, and C [Table 2]. Previous studies clearly demonstrated that liver resection in cirrhotic patients accompanied with exacerbated transient hepatic dysfunction, impaired regeneration, increased risk of operative bleeding, postoperative ascites and bleeding varices, high portal flow in non-compliant vascular bed, and liver failure. These risks and postoperative mortality rates are closely related with the reserve of the liver. Nagasue et al. reported the results of major hepatectomies (more than two segments) in cirrhotic patients with the mortalities for Child-Pugh score A, B and C as 16%, 33%, and 100%, respectively. As a result, the candidates for a surgical resection should be preferably in Child-Pugh Class A. The curative resection is the only modality that can achieve survival benefits in HCC treatment. However, size and number of the tumors are not the only determinant for the selection of the resectable HCCs. In case of difficult tumor locations, the size of the tumor cannot be the main determinant for the decision of surgical resection. On the contrary, patients with peripherally located large HCCs could be good candidates for a surgical resection [Figure 2]. In an optimal HCC patient, with a good patient performance, no distant metastasis, a well-compensated liver reserve and a technically feasible tumor for a resection, it has been shown that bilirubin levels and portal hypertension are additional independent survival predictors. 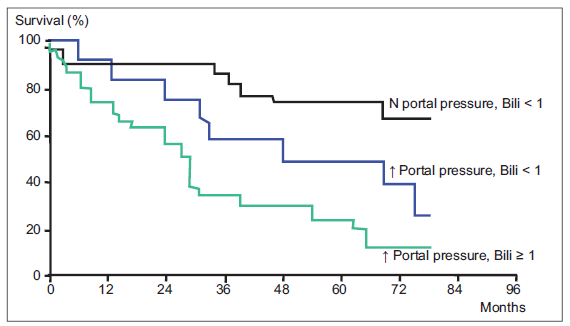 It was shown that in Child-Pugh Class A patients, without a portal hypertension and with bilirubin levels < 1 mg/dL compared with the patients with a portal hypertension and bilirubin levels > 1 mg/dL; 5-year survival rates were 74% and 25%, respectively [Figure 3]. In other words, patient who is a good candidate for surgical resection should be in stage Child A and moreover, they should be in a “better” Child A subgroup with a normal bilirubin level and without a portal hypertension. The indicators of portal hypertension as splenomegaly, thrombocytopenia, and esophageal varices should be checked. In a normal healthy non-cirrhotic liver parenchyma, liver resections up to 70% are well tolerated due to the intact regeneration capacity of the hepatocytes. The size of the hepatectomy must be as small as "oncologically" possible in HCCs. 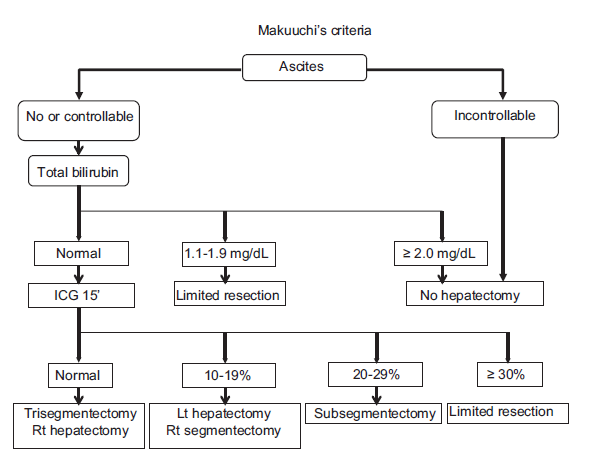 "The Makuuchi criteria" is an important algorithm for the HCC treatment in cirrhotic patients. This criteria uses presence of ascites, total serum bilirubin levels and the ICG disappearance rate for deciding the eligibility of the patients for a resection and the type of the surgical resection. In patients with uncontrolled ascites, bilirubin levels above 2 mg/dL, any type of hepatectomy is contraindicated. The ICG uptake rate in "Makuuchi criteria" is used as objective criteria for deciding the extent of the resection that can be safely performed. According to the ICG uptake, resections that can be safely performed are classified as, major hepatectomy (ICG < 10%), segmentectomy < 1/3 of liver (10% < ICG < 19%), subsegmentectomy < 1/6 of liver (20% < ICG < 29%) and a limited resection (ICG > 30%) [Figure 4]. We have to say that while deciding a surgery for a patient with HCC, we use the BCLC and the other algorithms as well. To avoid a misunderstanding, we have to highlight that we do not try to create an alternative system to the well-known systems (such as BCLC and others) to evaluate the HCC patients. This mnemonic flowchart may only help in assessing a systematic check of this important clinical decision making process. Here, we just want to re-read the BCLC and other algorithms from another direction but more simply and practically in the daily life. In our clinical practice, lots of HCC patients are referred to our department for the aim of resection from other cities by several clinicians. We observed that most clinicians (surgeons, but not an expert on liver surgery, oncologists, gastroenterologists, or internists) focus only on the size or number of the tumors in the liver while they were referring their patients. However, general condition of the patients (mostly bedridden or not), bone pains (possible metastasis), platelet counts or presence of esophageal varices etc., can be overlooked before the transfers of the patients. Sometimes the simplest points are missing in the complex algorithms. “PERISH” flowchart can be used as a simple check list in the clinical evaluation of the patients with HCC. This mnemonic flowchart could be more useful for the clinicians who are not experts on HCC. We believe that an easy learning method for the selection of the most appropriate candidates for surgical resection can create a charm among the non-expert clinicians on HCC, as well. This mnemonic can make the evaluation of the HCC patients more attractive due to its simplicity. Asking for the patients’ general condition, that is, whether the patient is symptomatic and in bed > 50% of the day, should be the first question to select the correct cases for the resectable HCCs. Following this, asking for suspicious metastasis as bone pain and radiological evaluation of the abdomen and thorax is mandatory. Calculation of the Chid-Pugh score is only the third step of the evaluation. Good candidates for a surgical resection should be Child-Pugh “A” but a better subgroup “A” with normal bilirubin levels should be preferred. Technical feasibility of the resection according to the intra-hepatic distribution of the tumor(s) should be done radiologically and the patients preferably should not have a portal hypertension. If the patient fulfils all the previous steps, the surgeon can perform the ICG clearance test, if necessary [Table 3]. As a result, following the "PERISH" flowchart in the treatment of any HCCs may prevent "perish" of the surgeons while deciding the appropriate treatment of HCCs. 2. Llovet JM, Burroughs A, Bruix J. Hepatocellular carcinoma. Lancet 2003;362:1907-17. 3. Chang MH, You SL, Chen CJ, Liu CJ, Lee CM, Lin SM, Chu HC, Wu TC, Yang SS, Kuo HS, Chen DS; Taiwan Hepatoma Study Group. Decreased incidence of hepatocellular carcinoma in hepatitis B vaccinees: a 20-year follow-up study. J Natl Cancer Inst 2009;101:1348-55. 4. Llovet JM, Di Bisceglie AM, Bruix J, Kramer BS, Lencioni R, Zhu AX, Sherman M, Schwartz M, Lotze M, Talwalkar J, Gores GJ, Panel of Experts in HCC-Design Clinical Trials. Design and endpoints of clinical trials in hepatocellular carcinoma. J Natl Cancer Inst 2008;100:698-711. 5. El-Serag HB, Mason AC. Rising incidence of hepatocellular carcinoma in the United States. N Engl J Med 1999;340:745-50. 6. Sirivatanauksorn Y, Tovikkai C. Comparison of staging systems of hepatocellular carcinoma. HPB Surg 2011;2011:818217. 7. Llovet JM, Brú C, Bruix J. Prognosis of hepatocellular carcinoma: the BCLC staging classification. Semin Liver Dis 1999;19:329-38. 8. Oken MM, Creech RH, Tormey DC, Horton J, Davis TE, McFadden ET, Carbone PP. Toxicity and response criteria of the Eastern Cooperative Oncology Group. Am J Clin Oncol 1982;5:649-55. 9. Thomas RL. Learning the alphabet of healthcare IT. Healthc Financial Manag 2006;60:100-2. 10. Stalder DR. Learning and motivational benefits of acronym use in introductory psychology. Teaching Psychol 2005;32:222-8. 11. Liver Cancer Study Group of Japan. Primary liver cancer in Japan. Clinicopathologic features and results of surgical treatment. Ann Surg 1990;211:277-87. 12. Fasani P, Sangiovanni A, De Fazio C, Borzio M, Bruno S, Ronchi G, Del Ninno E, Colombo M. High prevalence of multinodular hepatocellular carcinoma in patients with cirrhosis attributable to multiple risk factors. Hepatology 1999;29:1704-7. 13. Natsuizaka M, Omura T, Akaike T, Kuwata Y, Yamazaki K, Sato T, Karino Y, Toyota J, Suga T, Asaka M. Clinical features of hepatocellular carcinoma with extrahepatic metastases. J Gastroenterol Hepatol 2005;20:1781-7. 14. Sasaki Y, Imaoka S, Shibata T, Wada H, Nagano H, Ishikawa O, Furukawa H, Fukuda I, Kyoama H, Doi O, Iwanaga T, Ishiguro S. Successful surgical management of pulmonary and adrenal metastases from hepatocellular carcinoma. Eur J Surg Oncol 1991;17:84-90. 15. Manizate F, Hiotis SP, Labow D, Roayaie S, Schwartz M. Liver functional reserve estimation: state of the art and relevance for local treatments: the western perspective. J Hepatobiliary Pancreat Sci 2010;17:385-8. 16. Franco D, Capussotti L, Smadja C, Bouzari H, Meakins J, Kemeny F, Grange D, Dellepiane M. Resection of hepatocellular carcinomas. Results in 72 European patients with cirrhosis. Gastroenterology 1990;98:733-8. 17. Nagasue N, Yukaya H, Kohno H, Chang YC, Nakamura T. Morbidity and mortality after major hepatic resection in cirrhotic patients with hepatocellular carcinoma. HPB Surg 1988;1:45-56. 18. Llovet JM, Fuster J, Bruix J. Intention-to-treat analysis of surgical treatment for early hepatocellular carcinoma: resection versus transplantation. Hepatology 1999;30:1434-40. 19. Nagasue N, Yukaya H, Ogawa Y, Kohno H, Nakamura T. Human liver regeneration after major hepatic resection. A study of normal liver and livers with chronic hepatitis and cirrhosis. Ann Surg 1987;206:30-9. 20. Makuuchi M, Kosuge T, Takayama T, Yamazaki S, Kakazu T, Miyagawa S, Kawasaki S. Surgery for small liver cancers. Semin Surg Oncol 1993;9:298-304.